“The Christian Mythologists, after having confined Satan in a pit, were obliged to let him out again to bring on the sequel of the fable. He is then introduced into the Garden of Eden, in the shape of a snake or a serpent, and in that shape he enters into familiar conversation with Eve, who is no way surprised to hear a snake talk; and the issue of this tête-à-tête is that he persuades her to eat an apple, and the eating of that apple damns all mankind. After giving Satan this triumph over the whole creation, one would have supposed that the Church Mythologists would have been kind enough to send him back again to the pit: or, if they had not done this, that they would have put a mountain upon him (for they say that their faith can remove a mountain), or have put him under a mountain, as the former mythologists had done, to prevent his getting again among the women and doing more mischief. But instead of this they leave him at large, without even obliging him to give his parole—the secret of which is that they could not do without him; and after being at the trouble of making him, they bribed him to stay. They promised him ALL the Jews, ALL the Turks by anticipation, nine-tenths of the world beside, and Mahomet into the bargain. After this, who can doubt the bountifulness of the Christian Mythology? The often repeated theme that atheists have no reason to be moral without a god is probably the most popular and repeated myth made about atheism. The claims come in a variety of forms but they are all based on the assumption that the ONLY source of morality is from a God on high, a religion…and preferably only the Christian one. Therefore, without Christianity humans cannot live moral lives. This of course automatically deprecates all other religions on this planet. The thing I find most amazing is that Christians, Muslims, Jews, Hindu’s, and the myriad other denominations, sects, and cults in the world have been trying for maybe three plus millennia to prove that there IS a God…and they have ALL totally, completely, entirely failed. They all have stories that depend on magic…that envisions demons, devils, ghosts, angels, etc., and they all were formed a few thousand years ago when mankind was going through a huge god-making period in our history…conveniently forgetting that humans have been roaming around the earth for 200,000 years or so without a need for really invasive gods. 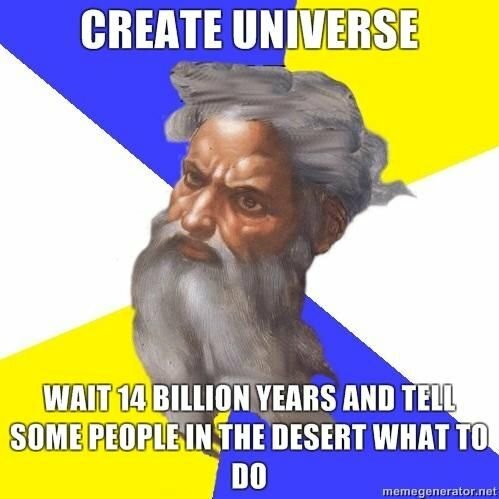 So anyway, there is no god or gods, therefore all this morality the Christians talk about is just made up by some goat herder desert dwellers a few thousand years ago. In other words morals come from mankind. Wars and kindness comes from man. Good and evil comes from man. We are ultimately responsible for ALL that goes on in our history, culture, and civilizations…a non-existent god cannot be blamed for our shortcomings or our triumphs. Did the Jesus who was supposed to be a God also really exist, or was he a mythical construct of people trying to get a religion off the ground? The Christian religion arose in a time when people were inventing religions one after another. There were hundreds of competing gods roaming around in the ancient times which Jesus was supposed to be born into. The war of words and wildly different world-views between Christians and non-believers has been going on for nearly two millennia now, and may finally be coming to an end in our modern scientific age where the stories can be subjected to real investigation. There is not the slightest bit of physical evidence to support a historical Jesus; no manuscripts written by him, no artifacts or works of carpentry, no surviving dwelling, nothing that is directly attributable to a man that was supposed to work magic and speak to hundreds or thousands of people, in a golden age of writing and recording the ancient world. All the claims of a historical Jesus are derived from 2nd. Hand writings—that is non-eyewitnesses to the events. All writings about Jesus come well after he was supposedly crucified and the ones that made it into the Bible are purposely mis-identified in the Bible as Apostles, when in fact we don’t know who wrote them. There are no Roman records that detail Pontius Pilate executing a man called Jesus. All source material about Jesus is derived from hearsay accounts and come well after his death. Laying the Gospel accounts of Matthew, Mark, Like, and John side by side we can see there are tremendous differences in the story. These are not just “eyewitness” differences one would expect from different people seeing the same scene at the same time, they are fundamental differences that are not compatible. What did Jesus say at the end? Did the women tell the Apostles that he was arisen–or not? Who was at the tomb when the women came? Did the earth tremble and the sun go dark for three hours and graves spit out dead zombies? We know the Gospels were written by anonymous authors and they were written from 35 to 70 years after his death. We know they were originally written in Koine Greek, instead of Aramaic, and that we only have copies of copies of copies instead of originals and we don’t even know for sure if we have the real words of the man—if he really existed. We don’t have any secular writing that mentions Jesus…supposedly God Himself…that is contemporary to his (mythical) life. All we have is hearsay…courts of law do not allow hearsay as evidence, neither does modern scholarship, and we should not recognize the biblical writings as real evidence. I don’t think an honest scholar can take any of the books from the New Testament as absolute ‘God breathed’ truth. However, aside from two passages in the works of a Jewish writer mentioned above and two heavily disputed passages in the works of Roman writers, there just isn’t any contemporary–or soon after his death, mention of Jesus Christ in the writing of scholars and historians. Philo (20 BC-50 AD) was born before the beginning of the Christian era, and lived well after the reputed death of Christ. Philo was the one who developed the doctrine of the Logos, or Word, and although this Word incarnate (Jesus himself) supposedly dwelt in that land, and in the presence of multitudes he revealed himself and demonstrated his divine powers–Philo apparently never knew it. His writings include an account of the Jews covering the entire time that Christ was said to exist on earth. He lived in or near Jerusalem when Christ was supposedly born and when the Herod massacre occurred. Philo was there when Christ made his triumphal entry into Jerusalem; he was there when the crucifixion and reputed earthquake, supernatural darkness, and the resurrection of the dead zombies in the graveyard took place. – He never wrote about it. Had these events really taken place you would think the word would spread all over the Middle East and Mediterranean world which at the time was teaming with religious fervor and many many stories going around about a Messiah. Here was a man who would be the Messiah, who raised the dead and cured incurable diseases and yet no one wrote of him. Justus of Tiberius was a Jewish author and historian who lived in the second half of the 1st century AD and was a native of Christ’s own country, Galilee. He wrote a history covering this time of Christ’s reputed existence. Sadly the original work has perished, but Photius, a Christian scholar and critic of the ninth century who was acquainted with it says: “He (Justus) makes not the least mention of the appearances of Christ, of what things happened to him, or of the wonderful works that he did” (Photius’ Bibliotheca, code 33). For sixteen hundred years or so Christians have been citing this passage as a testimonial, to the historical existence, and the divine character of Jesus Christ. However most all Biblical scholars agree that the sentence is probably a pious forgery written by a scribe or zealous Christian many years after Josephus. “Its brevity disproves its authenticity. Josephus’ work is voluminous and exhaustive. It comprises twenty books. Whole pages are devoted to petty robbers and obscure seditious leaders. Nearly forty chapters are devoted to the life of a single king. Yet this remarkable being, the greatest product of his race, a being of whom the prophets foretold ten thousand wonderful things, a being greater than any earthly king, is dismissed with a dozen lines.”– The Christ, John E. Remsburg, reprinted by Prometheus Books, New York, 1994, pages 171-3. I’m divided on this…the man may have existed, but I really doubt he was the Messiah or divine in any way. Just myths like the Old Testament. Too much stuff just doesn’t add up…the whole story is incoherent and flawed…not a sign of a God inspired work. The Christian religion has had a few thousand years now to make a case for the fundamental concepts it pushes upon our world. It has failed spectacularly to show ANY evidence for supernatural or magical forces, the existence of angels or demons or Satan, the efficacy of any ones prayers, the infallibility of heavens emissaries on earth (the Popes). It has failed horribly, and has never done what it claims it can do. Of course I am not, by any means, the only person to understand this and note the inconsistencies and illogic that runs rampant throughout their beliefs. Despite this several thousand years of apologetics and trying to clean up their Bible of the many mistakes it continues to be an unproven hypothesis. Many scholars think that Eusebius interpolated his writings. In Ecclesiastical History, he writes, “We shall introduce into this history in general only those events which may be useful first to ourselves and afterwords to posterity.” (Vol. 8, chapter 2). In his Praeparatio Evangelica, he includes a chapter titled, “How it may be Lawful and Fitting to use Falsehood as a Medicine, and for the Benefit of those who Want to be Deceived” (Vol. 12, chapter 32). There is not the slightest bit of physical evidence that supports a historical Jesus; there are no artifacts or dwellings, no works of carpentry, no written manuscripts (by Jesus), nothing. All we have are writings from other people and there is no contemporary recording of the man/God nothing written while he was alive. All documents about Jesus came well after his supposed life on earth from people who had never even met him, from unknown authors, or from fraudulent mythical /allegorical writings. There are no Roman Records that show Pontius Pilate executed a man named Jesus. According to the Gospels several things happened around the time that Jesus died on the cross. His death was supposedly accompanied by a three hour blackout of the sun, earthquakes, and the rising of the dead. No record of these events can be found anywhere outside the Bible. So what is a person to do? It seems to me that anyone searching for something greater than oneself, a belief to offer hope and help, a God who’s always there to comfort and relieve stress is out of luck. There are a little over 2.2 billion believers in the Christian God and only 1.1 billion non-believers, but those non-believers actually took the time to research their position and beliefs. They didn’t come to that conclusion as a result of what they were born into. Of the 2.2 billion Christians in the world the vast majority have never researched one little bit of religion. Their fathers and mothers were Christians…so they are too. They believe in some nebulous creator God who made the world 6,000 or so years ago and listens to their prayers and somehow watches over all of them. see more Lolcats and funny pictures, and check out our <a href="http://memebase.com/category/business-cat-2/"Business Cat lolz!